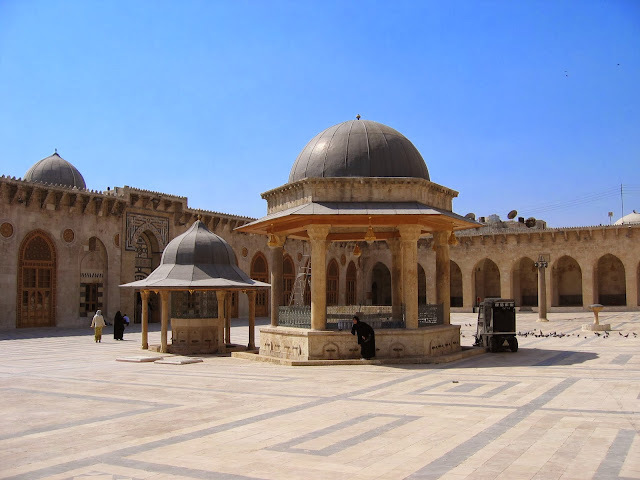 The Omayad Mosque courtyard, with Şadirvans in pavilions, in Aleppo, Syria. The UN came out with a less than stunning announcement this week - the President of Syria knows about the war! *gasp* Okay, the announcement was that the U.N investigators traced knowledge of torture and other activities classified as war crimes to the "highest levels" of the Syrian government. Let's be candid here - we all know that the highest levels of government know what's going on. President Bashar al-Assad is no fool; he knows what is going on. Which makes me wonder - why the secret list of suspects from the U.N investigators? Why act as though President Assad knows nothing? Because the U.N wants to try him on these war crimes, along with any other official high enough in his regime. I have heard people in the U.S. among those calling for trials. Again I wonder - what would these people say if the U.S. were called to account for its violations of human rights? I will not go over the list of violations, because either you know about them and believe they happened, or you watch Fox News. But the U.S. has trampled over our own citizen's human rights again and again these past 13 to 14 years, as well as flat out acting ignorant about non-citizen's rights. So who are we to start pointing fingers and judging people in Syria? I do not agree with any of the tactics that President Assad has taken to stop the rebels, from starving neighborhoods to using chemical weapons. But I also don't agree with our soldiers being given orders to man checkpoints in Baghdad and to shoot anyone trying to cross without following strict US rules. A pregnant woman trying to drive to the hospital died because she was focused on one thing - having her baby. I don't agree with the border patrols who made immigrants eat marijuana and then left them with no shoes and no jackets in the desert at night. I don't agree with New York police stalking journalists and believing they have the authority to stop anyone they want despite the Fourth Amendment. I don't agree with Miami police breaking cell phones to destroy pictures of the policemen abusing their power. And I don't agree with anything at Guantanamo Bay. I apologize; I said I wouldn't list our human rights violations (I didn't even cover a tenth of them) but I need to make a point. The U.S. lost the moral high ground long ago, and it feels like the pot calling the kettle black when our government says to Syria, "Naughty, naughty". The worst part about the situation is our government has the point to stop the war using diplomatic channels. If we worked with Russia and offered concessions to get Russia to stop protecting Syria, the entire war would stop relatively quickly. And our government could have done this two years ago, last year, or six months ago. Yet, we won't because of pride and prejudice. How many more need to die before we do the right thing?